As a ghost hunting hobbyist, I visited the Bethlehem Cemetery in St. Louis, Missouri. It was broad daylight and I was the only one in the very large graveyard – the oldest in St. Louis. Parking on a slight uphill road, I got out with my ghost equipment — consisting of camera, voice recorder, infrared thermometer and a gauss meter, hoping to catch evidence of a ghostly manner. Equipment at the ready, I walked away from my car and took my first picture. Prepared to take another photograph, I was disappointed when I found I only had one picture left. Angry with myself for not being prepared, I huffed back to my car, ready to leave. However, before I left, I decided to listen to the voice recorder for the few measly minutes that I had recorded. As I had just turned the recorder on, I heard a thump on the back of my bumper. Stopping the recorder, I turned around to see what had happened, saw nothing, and continued to rewind my recorder, when I was surprised by yet another thump. This time, I quickly opened the car door, and looked underneath the vehicle and all around the car, seeing nothing. Because I am more afraid of the living than the dead, I was parked in such a fashion that no bushes or trees were close to the car providing for any unwanted surprises or hiding places for unseen visitors. Finding nothing and determining that the car was just “settling”, I returned to listen to what, if anything, I had recorded. Suddenly, the car lurched forward!! Mind you, I was parked with the car facing upward on a slanted hill…no keys in the ignition, sitting in silence, with absolutely no one around. Well, that was it! I quickly threw my recorder onto the passenger seat and got the heck out of there, all the while looking in my rear view mirror. My question is, is it possible, scientifically, to have a car sitting on a slope, facing uphill, and the car suddenly lurches forward enough to have your shoulders leave the backrest of your seat? Ruling out all scientific explanations, I can now only determine that the thumps and the lurching of the car were, in fact, a ghostly experience. Did they want me to leave? Or, were they just letting me know they were there? Though I was frightened by the experience, I was also elated to have had the encounter. I can only hope that next time I run into such an experience that I can stay awhile, take temp readings and recordings, as well as have plenty of film on hand to capture the ghostly phenomenon while it happens. 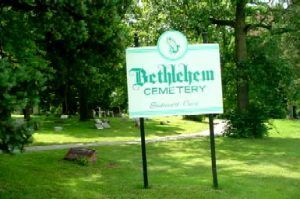 The Bethlehem Cemetery is located at 9650 Bellefontaine Rd., St. Louis, Missouri.